A personal account of the fraileas of Rio Grande do Sul, Brazil. In the next part of this article Marlon will complete this survey by describing and illustrating all the species that he saw in the state of Rio Grande do Sul. Photography by the author. This widespread species from southern Rio Grande do Sul, Brazil, and northern Uruguay is popular with collectors and easily grown from seed. Fraileas don't often open their flowers, but you stand the best chance of seeing them with their gorgeous, golden flowers open in the heat of high summer, after a watering early in the day so that the humid­ity is high, and even better if the weather itself is thundery and sultry. Mid-afternoon is when you are most likely to find them open. Photo: Marlon Machado. From the end of October until the middle of December in 2005, and from the middle of October until the end of November in 2006, I spent nearly twelve weeks travelling in the state of Rio Grande do Sul, Brazil, doing fieldwork for my PhD project on the systematics of the Notocactus group of Parodia. Part of my project is a survey of as many pop­ulations as possible of P. ononis and related species, demanding extensive travelling throughout Rio Grande do Sul. The sampling strategy that I used was to divide the area of the state using a grid with cells of fifteen square kilometres, and to try to sample one population of the P. ononis complex in each cell of the grid. Bearing in mind that the total area of the state is 282,062 sq km (about 35% bigger than the size of Great Britain), this translates into a very large number of cells to investigate! This amounted to a total mean­dering journey of some sixteen thousand kilometres, more or less covering the whole area of distribution of the P. ononis complex in Rio Grande do Sul. 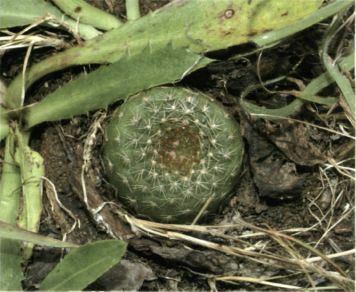 It was thus possible to study practically all the different cactus species that occur in the state. Fig. 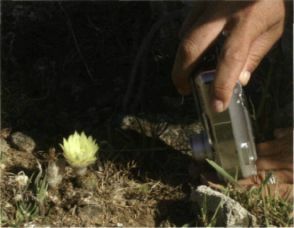 2 Lidyanne Aona photographing a specimen of Frailea gracillima flowering in habitat. 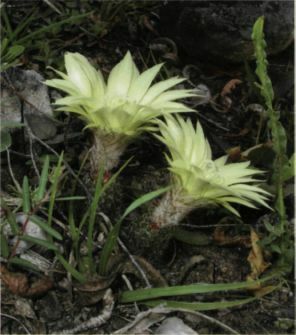 There are two other plants of F. gracillima in the picture, one by the side of the individual in flower, and another one at the bottom of the picture. Out of flower, these little plants can be very tricky to find! Fig. 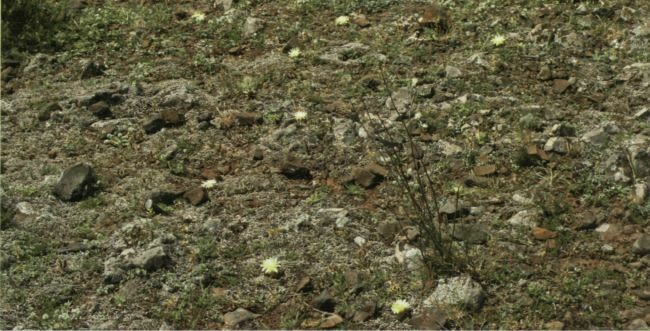 1 Frailea pygmaea flowering in habitat. 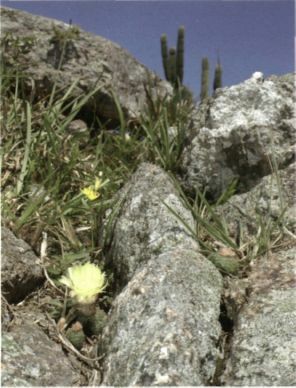 In this picture three plants can be seen growing between the rocks. The tall, columnar cactus in the background is Cereus hildmannianus. A most enjoyable experience was to discover Frailea. It was fascinating to observe these little plants, which are among the smallest of all cacti, growing in their natu­ral surroundings, hidden among pebbles, mosses, tufts of grass and the white stems of the creeping fern, Selaginella sellowii. In spite of their size and colour that makes them blend very well with their surroundings, I have good eyes and usually had no trouble in spotting the tiny fraileas, even when I was not really looking for them. It became a delightful experience to search for the little plants at the places where I stopped to study plants of the P. ononis complex, since almost always the place held at least one species of Frailea as well. Fig. 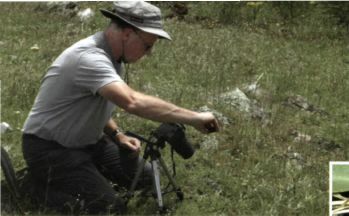 3 (left) Graham Charles photographing a specimen of Frailea pygmaea in habitat. Can you see the plant? Fig. 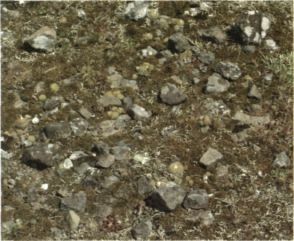 4 (below) Close-up of the previous picture - now it is possible to see the specimen of Frailea pygmaea that Graham Charles was photographing! Fig. 5 (below right) Close-up of the specimen of Frailea pygmaea shown in the previous picture. Looking at a close-up picture like this makes it more difficult to realize just how small these plants really are. I must admit that before seeing these plants in the field I did not have a great interest in the genus. I never found Frailea particularly attractive, and have never cultivated them. Most of the plants that I have seen were in other people's collections and were often bloated, unattractive specimens with feeble spination. The only species that I always found attractive was F. castanea, and this was the one species that I was looking forward to seeing in the field. Needless to say, my opinion about Frailea changed completely after seeing them in habitat! I was soon fascinated by these little plants. I think that what really caught my imagination was the diminutive size of the plants, the large flowers, and the cryptic, more or less geophytic, nature of most of the species. During my first trip in 2005, my knowledge of Frailea was minimal. I had no idea about how many species existed nor how to differentiate them. Looking back, I now think that this was advantageous, since it meant that I could study them, observe their characteristics, and look for the similarities and differences among them without preconceptions. By taking good photographs of each Frailea species, I was later able to put a name to the plants that I encountered. I also collected a lot of material for the herbarium. Yes, I killed many plants of Frailea and of other cactus species, but this enabled me to inspect the plants' anatomy in great detail. One surprise was to find that all Frailea species possess well-developed tuberous roots. 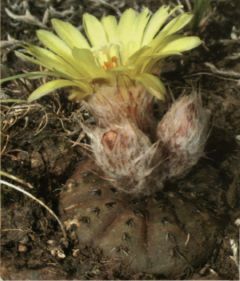 However, this should not be a big surprise, because it is a common feature of most other diminutive cacti, such as, for instance, Turbinicarpus, Rebutia etc. These roots have the function of storing enough sustenance so that plants can survive the long periods of drought that they have to endure. Tuberous roots also have the function of anchoring the plants into the ground. 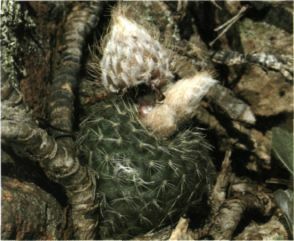 As commonly happens with tuberous-rooted cacti, in times of drought the plants lose water and shrink, the swollen root contracting and pulling the stem down, resulting in the top of the plant body lying level with, or some­times even below, ground level. 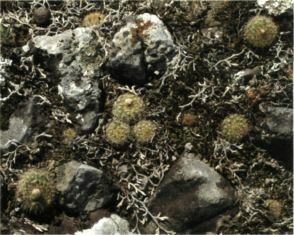 This is especially true of the disciform, flatbodied Frailea species such as F. cataphracta, F. phaeodisca and F. castanea, which can be drawn completely below ground when dehydrated. Fig. 6 Habitat of Frailea castanea, where ten specimens can be seen in flower. 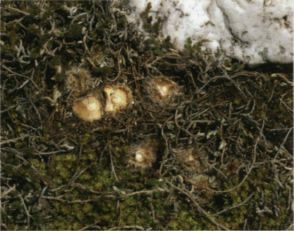 The whitish threads visible in the picture are desiccated stems of the creeping fern, Selaginella sellowii. Fig. 11 (top left) A specimen of Frailea gracillima flowering in habitat. Fig. 12 (above) Two specimens of Frailea gracillima flowering in habitat, with another one just visible in the background. Fig. 13 (left) A many-headed specimen of Frailea gracillima with four flowers open at the same time. Fig. 15 (below) A specimen of Frailea phaeodisca flowering in habitat. The whitish threads visible in the picture are desiccated stems of the creeping fern, Selaginella tellowii. Another fascinating characteristic of Frailea is the fact that plants of this genus are cleistogamous. This is a botanical term derived from the Greek words kleistos, closed (from kleiein, to close) and gamos, a procreative or propagative union. The term relates to the fact that the flowers do not need to open in order to be fertilized with their own pollen. Plants produce flower buds, but these do not expand their petals. Instead they selfpollinate and develop into fruits with the flowers never opening. The advantage of this reproductive strategy in the case of small plants like Frailea is clear. 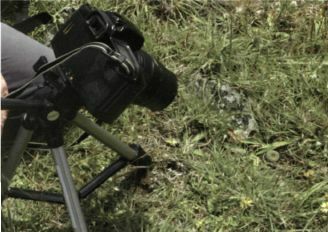 Being selffertile, even a single plant can colonize a new habitat and, by producing seeds without having to open their flowers, the plants can cope better with adverse environmental conditions, such as drought. The large flowers of Frailea are likely to represent a large expenditure of energy and to be responsible for a large amount of water loss, which is not beneficial to a small plant like a Frailea. Having the ability to produce seeds without opening the flowers is a clear advantage, because the plant can set seed even when the environ­mental conditions are unfavourable, expending the smallest possible amount of energy. This is also an advantage for the grower of these plants, since production of seed is guaranteed, as is also the purity of the offspring obtained. The disadvantage of this strategy is that due to the lack of gene exchange between plants of different genetic makeup, the offspring of self-pollinated plants will have a limited amount of genetic and morphological variation. Naturally, if the environmental conditions are favourable, then plants of Frailea will open their flowers. I saw plants of many of the species in flower, and at some places I saw entire populations of Frailea in full flower, making the plants quite easy to locate, and providing me with an idea of the abundance of these plants. Fig. 17 A close-up of the clump of Frailea gracillima ssp. horstii (row the previous picture. This photograph was taken in November 2005. Fig. 18 A photo of the same clump of Frailea gracillima ssp. horstii taken a few weeks later. Sheep have eaten all the heads of the plants. Fig. 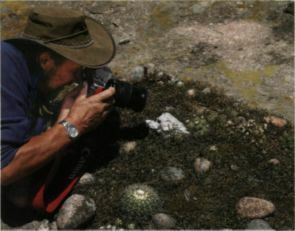 16 Chris Pugh photographing a clump of Frailea gracillima ssp. horstii. Although it looks as though there are several plants, actually there are just three multi-headed specimens. The other cactus in the foreground is Parodia langsdorfii. Only when you find a whole field full of small yellow flowers do you realize just how plentiful they can be in certain places. This was the case with a population of F. castanea that I visited, where many plants in the population were in flower, and dozens of yellow flowers could be seen scattered throughout the extensive habitat (Fig. 6). It appears that the area had received a good amount of rainfall in the days prior to my visit, and the plants of F. castanea were very plump, standing well above the soil. For each plant that was in flower there were many others that were not, and at this place there were surely hundreds of plants. The funny part of the story came when I returned to the same spot about three weeks later, and surprisingly I could not locate more than a handful of plants: and this after spending a couple of hours searching in a place where I knew that this species was really plentiful! What happened was that the weather had been very hot and dry in the interval between my visits, causing the plants to shrivel and the tuberous roots to pull the heads below soil level, becoming covered in dust and thus practically invisible. The few plants that I managed to locate were found because their fruits were protruding above the level of the soil, not because I could see the bodies of the plants themselves (Fig. 7)! As well as F. castanea (Figs. 6-9 & front cover), other Frailea species that I have been able to find in flower were F. cataphracta (Fig. 10), F. gracillima (Figs. 2 and 11-14), F. phaeodisca (Figs. 15 & 21) and F. pygmaea (Figs. 1, 3-5 & 20). It seems that the plants need to be well watered in order to flower: at all places where I found plants in flower there were signs that it had rained not long before. 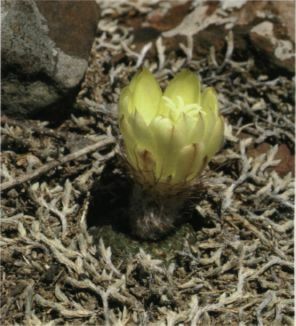 Finding plants of Frailea in flower was not uncommon, and certainly the plants flower regularly in habitat, thus allowing crosspollination and out­breeding to occur, which increases the genetic and morphological variability of the species that is essential for adaptation to changing environmental conditions. All plants of Frailea that I saw growing in habitat were singleheaded unless they were damaged. Finding injured plants, however, was not uncommon. Although the pictures accompanying this article only show nice plants, the truth is that fairly often I found plants whose heads had been eaten by sheep or trampled by cattle. These plants would produce new heads, and I saw plants that had endured several cycles of having been eaten and later regenerated. Fig. 22 A habitat of Frailea pumila, where dozens of plants of all sizes are growing among the mosses and the whitish stems of the creeping fern, Selaginella sellowii. Fig. 23 Plants of Frailea pumila. The whitish threads visible in the picture are desiccated stems of the creeping fern, Selaginella sellowii. Fig. 24 Frailea pumila growing among mosses and the creeping fern, Selaginella sellowii . Fig. 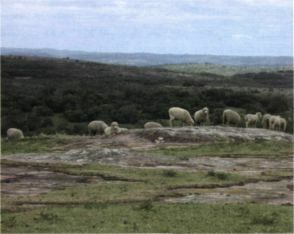 25 Sheep are one of the main enemies of cacti in the state of Rio Grande do Sul, because they eat the smaller and more tender species. 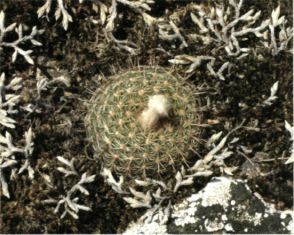 The flock shown in the picture was photographed at one of the habitats of Frailea phaeodisca. One such was the clump of F. gracillima ssp. horstii shown in figs. 16 and 17, photographed in November 2005. At first I thought that it consisted of several plants, but after a closer inspection it became clear that the clump consisted of only two or three plants, each with many heads. When I visited this same place again a few weeks later, all the heads had been eaten (Fig. 18). I revisited the place a year later during my 2006 trip, and the clump had regrown with even more heads (Fig. 19)! 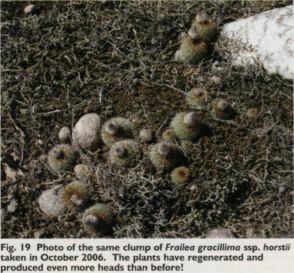 It appears that Frailea cope better with the intense grazing than Parodia, perhaps because of their diminutive size that makes them escape being noticed by the sheep, and also due to their possession of a tuberous root: the head can be eaten but the tuberous root remains, this way making it possible for the plants to regenerate. The fruits of Frailea are quite variable. In some species the fruit wall is thick and it opens by a basal pore to release the seeds that are promptly harvested by ants (for example F. pygmaea — see fig. 20). In other species the fruit wall becomes dry, thin and papery, when the whole fruit detaches from the plant and is blown around by the wind, as, for example, in F. gracillima and F. bueneckeri. 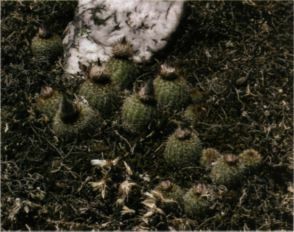 The seeds of Frailea are hatshaped and similar in shape to the seeds of the genus Astrophytum. Due to their shape, these seeds are capable of floating, and in addition to being dispersed by ants and wind, Frailea seeds are also scattered by water when it rains. The distribution of Frailea in the state of Rio Grande do Sul is restricted to the southern portion of the state, in the region called the pampas (an area characterized by low, rolling hills and dominated by grasslands) in the south-west of the state, and in the mountainous region of the southeast, which has a mixture of pampas vegetation, forests, and shrubby vegetation. 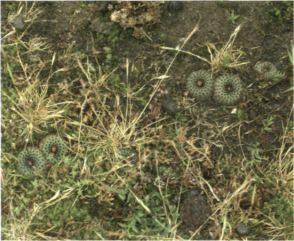 The fraileas grow in the mossfilled crevices of rocky outcrops, among the pebbles near the rocky outcrops, in grassy, gravelly areas where the thin soil cover minimizes competition from other plants, or in very sandy areas.